Introducing Aditya 'Romeo' Dev for your pleasure! This little guy, measuring in at a mere 2'9" and about 20 pounds, is India's latest sensation. The local gym where Aditya pumps iron daily is always packed with observers, the Daily Mail reported. "I've been training as a bodybuilder for the last two years, and by now I think I must be the strongest dwarf in the world," Dev, 19, told the Mail. "My size has never stopped me." 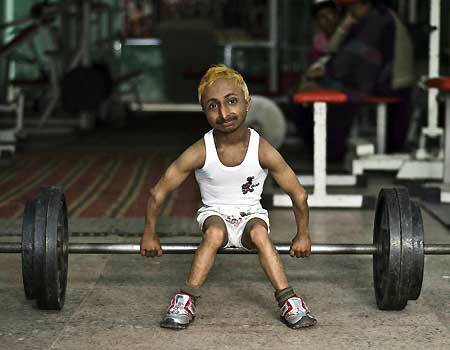 In 2006, after months of intense exercise, the Guinness Book of World Records named Dev the smallest bodybuilder on the planet, the Telegraph reported. He also dances, gals. Get on it.